If you would rather visit one of our recycling centres to pay in person, then please see the delivery tab for more information on stockists. Pro-Grow, is a fine, Soil Association certified, organic soil conditioner made in Britain that is rich in nutrients and essential trace elements providing plants with an ideal growing medium. Suitable for bedding and top dressing on lawns, trees and shrubs as well as on annual and perennial crops. Particularly effective for improving low quality soils where fertility and organic matter have been reduced by long term use of chemical fertilisers. Apply 5-7 cm (2-3") of PRO-GROW™ to the surface of the soil and fork into the top 15cm (6") of the soil. Plant seed or flowers as normal. Therefore, in a depth of 5cm, one bag 30L cover about 1m x 0.6m (0.6m2). Come directly to one of our recycling centres to collect your Pro-Grow – take a look at the stockist finder to find your local recycling centre. Pre-order online with our Click and Collect option and collect your order from one of our 10 sites where this option is available. When you place your order you will be given a unique order number which you must bring with you, along with a form of valid ID, when you collect. Please place your order before 1pm Monday - Friday so that we can get them ready for you to collect the following day. Place your order before 1pm on Friday if you want to collect on a weekend. Orders placed on the weekend will not be ready for collection until the following Tuesday. Please be aware that local retail sites may offer discounts and promotions which are not available online. Order online and get Pro-Grow delivered to your home. Pro-Grow 30L bags are delivered within 5 - 7 working days. In order to give you the best possible value for money, orders of any more than 5 bags may be delivered on a pallet. Pallets are delivered on a 7.5t vehicle and unloaded using a pallet trolley. If you order more than 5 bags of Pro-Grow 30L then you will need good access for a 7.5t vehicle and please be aware that the pallet trolley cannot travel across un-even surfaces (e.g. gravel). We will try our best to put the pallet where you need it but WE MAY ONLY BE ABLE TO DELIVER IT TO THE KERBSIDE. If you live in a countryside lane please mention on the checkout 'delivery instructions'. "Always great as usual to pick up bags of lovely fresh progrow - used this time for mulching a newly planted bed, weed suppressant, moisture preserver and nutrition all in one. Fantastic stuff, wish I had room to buy a cubic litre!" "I live using pro-grow as a mulch in autumn to provide cover for the soil knowing that long term the worms will be working in this lovely fibrous compost increasing nutrients and water retention for the soil. It is a wonderful cycle, adding program and then when clearing foliage or spent plants they go back in the green bag and become compost again. Fantastic. " "Great product, easy ordering and delivery as everyone says. Would I buy it again, definitely. " 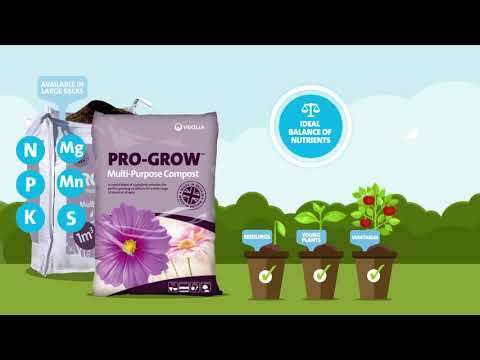 "very pleased with pro-grow and the plants are very happy too. and the plants are very happy too." "Soil Conditioner revives nutrient power in the old soil so well. I cannot afford without every year. " "Great service and fantastic product added to my clay garden and much improved better drainage and plants growing very well "
"I purchase two 1m3 bags of pro-grow last year and was impressed by the delivery, no problems. The product was used evenly throughout my garden, vegetable garden and flower beds. When dug in with existing soil it forms a good base for flowers/shrubs and vegetables. Additional benefit in the veg patch, very few weeds. Would highly recommend the product." "Recently we had a delivery of 200 bags of Pro-Grow to my allotment in North London. It was a great morning work out moving the bags down the pathway to the allotment and a chance to work on my muscle! Everyone seems very pleased with the product since using it the last 2 years, and we have had some great vegetables as a result :)"
""Greatly improves the presentation of the garden and the soil structure is improving all the time" - Andy Lewis, Head Gardener, Uppark House and Garden (National Trust) "
"It's my second allotment that I took on at the beginning of this year. It�s on a site in Hook which suffers from Heavy clay soil. Because of the soil I�ve used raised beds on the old plot, and a lot of these were filled with Pro grow. I find the fruit and vegetables love it, and it really retains moisture which is much better than the compost I�ve had in other beds. Compost I�ve used becomes very dry very quickly, and if you have a year like this year with not a lot of rain I find seeds don�t germinate as well as bed filled with Pro grow." "Thank you! The 2 bulky bags arrived on time and delivered to the building site as ordered.Today we have started to spread it and work it in, with the promise of good growing conditions next year." "My two bulk bags arrived earlier than expected, were very tidily and conveniently placed on delivery and contained a fine conditioner that was a joy to spread. I look forward to seeing the benefits it will bring to my plants." "We have recently moved into a new house and are turning a very bare plot into a garden. Soil improver is badly needed. We are delighted to have found Pro-Grow. We are currently using our second bulk bag. It is an easy-to-use product and makes a big difference to the quality of the soil. Pro-Grow in bulk bugs is good value. It is simple to place an order by phone or on the website, and the delivery arrives quickly. It is good to know that we are using compost from Hampshire garden waste on our new garden." "It was fantastic! I was very happy to pay the delivery man in cash and he gave me a receipt. All done in less than half an hour. Fantastic support from all of you guys. Thanks you so much and I will be inviting you to the planting day! " "When I got your leaflet I ordered 30 bags to see how it was. It's great but didn't go as far as I thought so I've ordered more to finish the rear garden beds, 100 bags for me and 40 for my neighbor as he was impressed with the quality and the price. Great product. Love it. " "Having used Pro-grow last year, I found the best results worked with vegetables. The key is getting the right balance of mixture (3 to 1). If mixing with a very high quality multi-purpose compost, then only add as directed. If mixing with a low quality (cheap) compost, then used heaped portions (or an extra spade/trowel portion). You can't really go wrong - we had some great green beans, lettuce and radishes that just went on forever! As I grew these in pots, I even used the spent soil as mulch afterwards - so absolutely no wastage. " "I use Pro Grow as a mulch to cover the soil in beds & borders. A nice thick layer not only helps retain moisture at this time of year, but also on our light chalky soils it gives a lovely dark appearance and looks great!" "Veolia superb product Pro-Grow is well screened, clean, consistent and easy to handle. This product would make an excellent soil conditioner and I would certainly use it in my own garden to improve my heavy clay soil." "I was lucky enough to receive some Pro-Grow after visiting the Pitsea Landfill open day last year which was good timing as I had just started to dig out a new garden bed. We mixed one part Pro-Grow with two parts compost and planted the bed with Roses, Lavender, Jasmine and Hebe's. They have grown at such a rate and look amazing better than anything I have every grown before just need to put some more in the rest of the garden now." "Pro-Grow is great value for money as peat free! I was also impressed with the environmental side of the product. "